The forecast for Amboy had a high temperature of 104°F and a low of 72°F. Winds would be light to calm, and the sky would be severely clear and steady all night! Sunset at 7:58 p.m. and sunrise at 5:30 a.m.
My European and metric system friends might enjoy converting those temperatures into Celsius for a jaw-dropping chuckle. Amboy Crater National Natural Landmark is on BLM (Bureau of Land Management) land near the tiny railroad town of Amboy, on National Trails Highway — a right-of-way that used to be marked as U.S. highway 66. 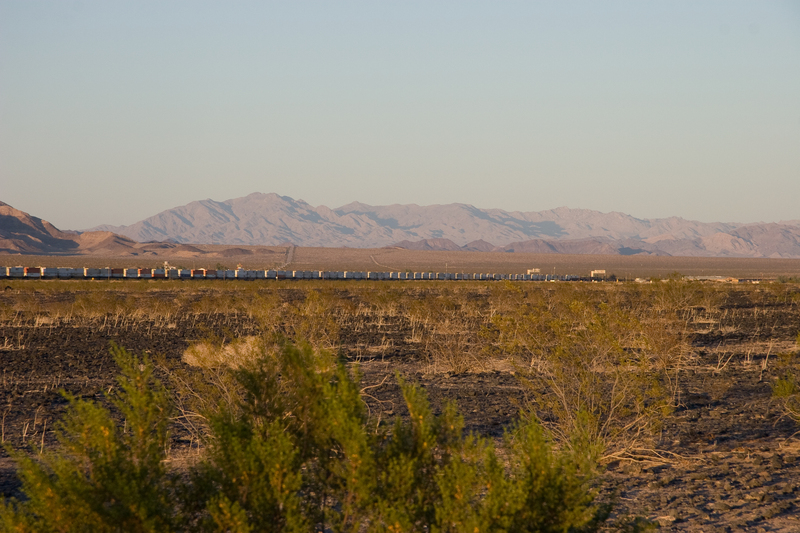 Amboy, California, has also been noted as the inspiration for the town of Radiator Springs from the Disney-Pixar movies Cars and Cars 2. We’ve written much about Amboy Crater in the past. It has become our new favorite observing location, featuring a paved parking area, picnic tables, and pit toilets. 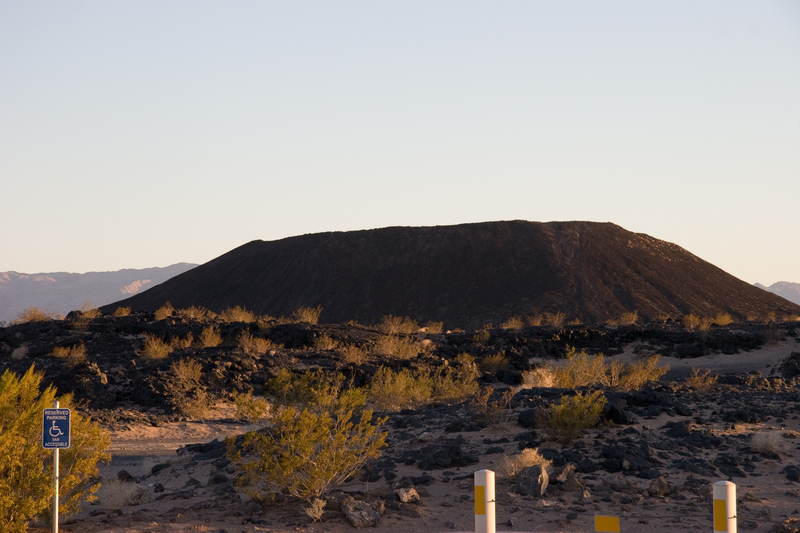 There’s a lovely one-mile trail that leads into the volcano crater known as Amboy Crater, which juts up from a large black-rocked lava field. When we arrived at the location, it was probably about 95°F. Our full dispenser of ice water and chilled Gatorades came in very handy! With sunset the temperature quickly dropped, and an hour after it was very pleasant short-sleeved observing under a perfect sky. We napped for a couple of hours at 2:30 or so, and woke to this stunning array of morning planets rising in the east. 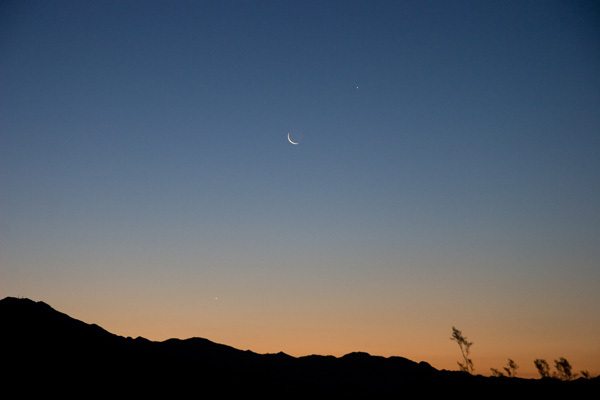 Jupiter, the Moon, and Venus, lined up in the eastern pre-dawn sky Sunday morning. By all means click for the full-res image, and notice the prominent earthshine on the very old moon. 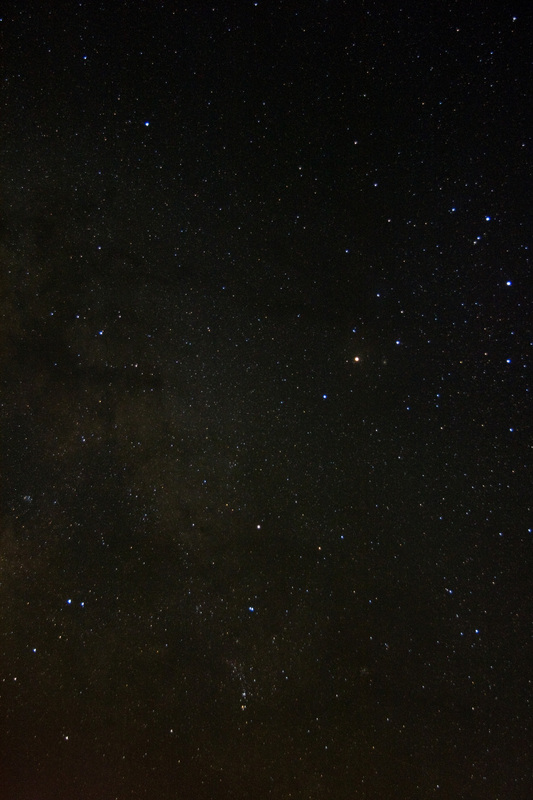 I was looking forward to capturing some summer-sky Milky Way favorites this evening. I stumbled onto a nearly perfect polar alignment. It was one of those nights when I had no battles to fight, no problems to solve, I could just collect photons. 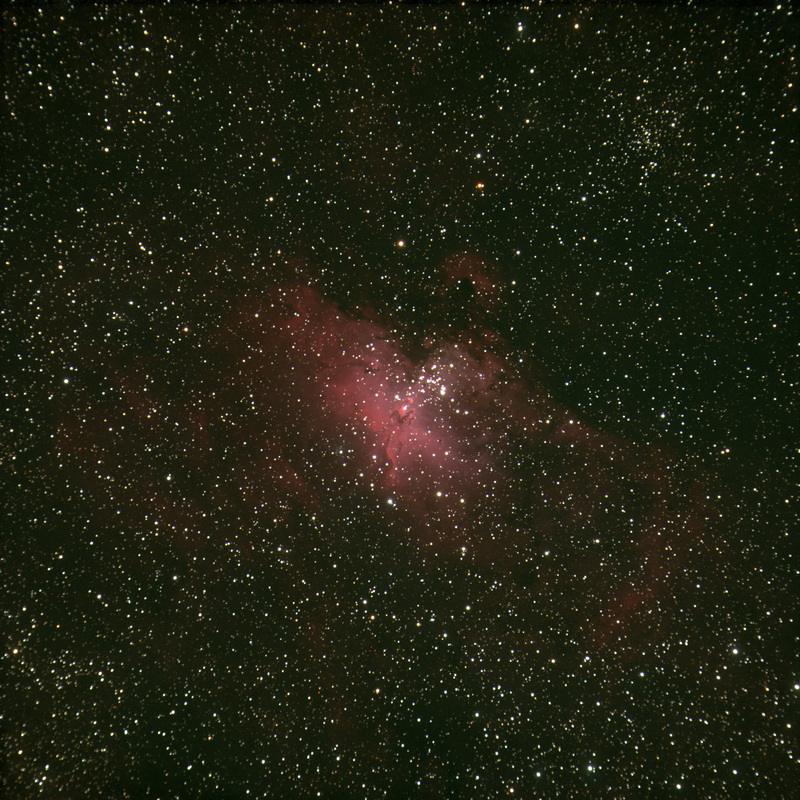 I spent my few summer hours on three targets I hadn’t imaged, all rising in the very dark eastern sky. Click each of these for the full-resolution 2048×2048 image. They turned out particularly well! I had previously shot M16, with one 15-minute exposure, and had an airplane fly through the shot. I didn’t want to photoshop the airplane away, and decided to collect more data for this stack. This one is three 15-minute exposures. 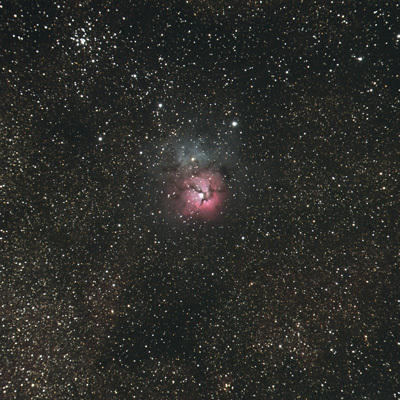 M20 the Trifid Nebula, with M21, an open cluster, in the upper left corner. 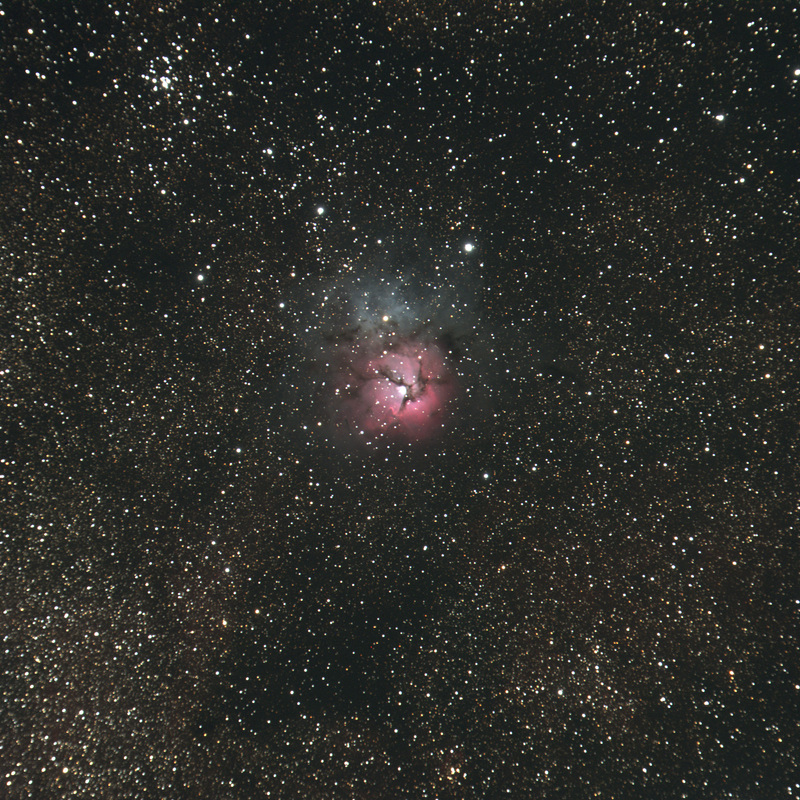 My Trifid is also three 15-minute exposures. I love seeing the lanes of dark Milky Way dust making inky lakes and tendrils among the stars surrounding the nebula. 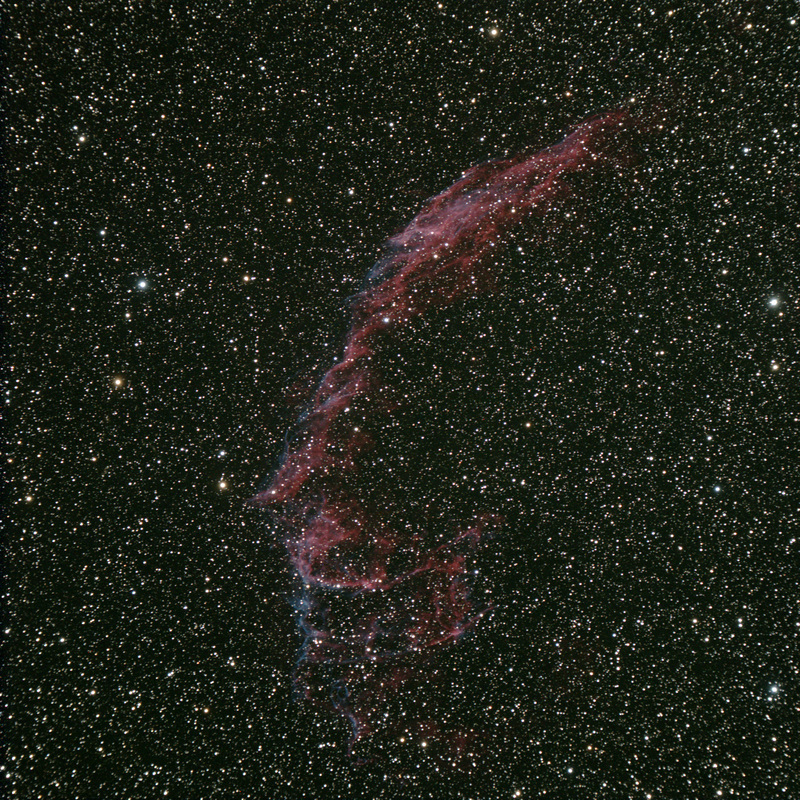 The eastern side of the Veil Nebula, this half is cataloged as NGC6992. 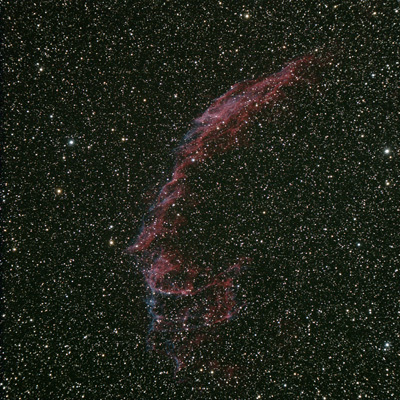 My small refractor is the perfect telescope to capture this half of the Veil Nebula, the eastern half, NGC6992. I hadn’t expected the mix of red and blue tendrils in this supernova remnant bow shock. This is four 15-minute exposures, stacked in Photoshop. The Scorpius constellation image was taken piggyback on the Traveler with my Canon 20D DSLR camera, one three-minute exposure. Thanks Mojo for reporting and posting. Very nice, esp. the Veil.